This is my first giveaway. I'm giving away a vented multi pot with straining lid. Handy for soup, sauce or warming milk. Ideal for cooking or steaming small portions. Use to mix and pour pancake or omelette batter and scrambled eggs. 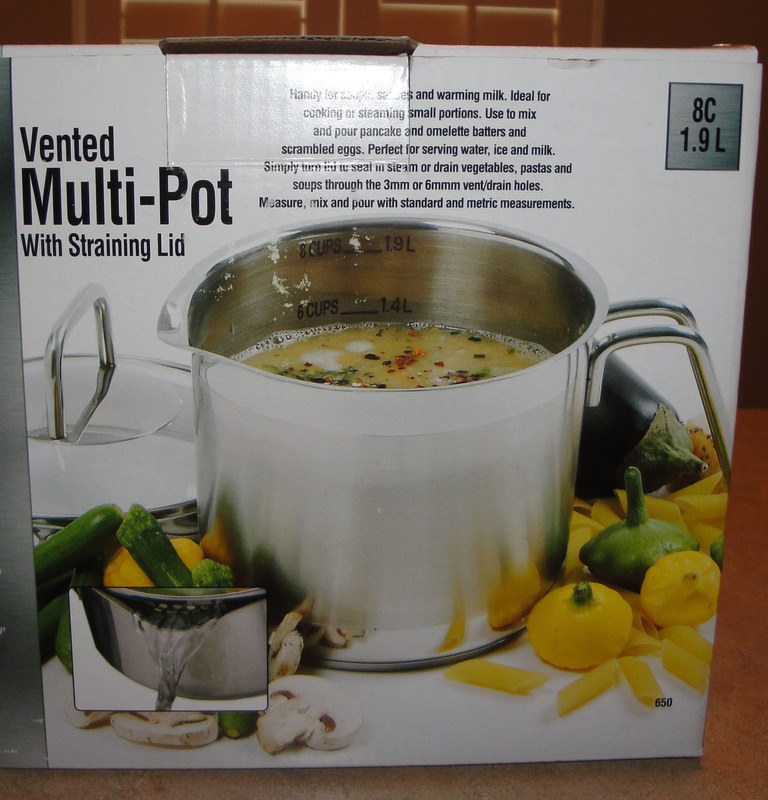 Simply turn the lid to seal in steam or drain vegetables, pasta and soup through vent / drain holes. Measure, mix and pour with standard and metric measurements. No company is paying me for this giveaway. I am doing this on my own. You might ask why? I want to show my friends I appreciate them. Thank you to all my friends. I will pick one winner at random. Contest starts today and ends on May 1, 2011 at midnight (CST). The winner will be announce on May 2, 2011. I will announce the winner here and on facebook, so you can get back to me and I can get your prize out to you as soon as possible. I'm excited to see who the winner will be. To enter this giveaway, leave me a comment below. Good luck! Congratulations to you!! And what a sweetie you are to do a giveaway on your own. Nicely done! Wow...what a great giveaway to do on your own. Very nice! This is a great giveaway and really generous! I can never have too many cooking pots and gadgets. What a great giveaway! I love your blog! I have the blog, but my hubby, Dan is learning to cook. He's good. He placed in one contest and is entering others this year. He would just love this! I love it too that he is cooking. Unfortunately I don't qualify for this giveaway, being in Canada, but the pot looks very useful - I envy the lucky winner :-). It's very geneorus of you to organize this! That is so cool! I've been eyeing one of these for a while, such a great giveaway! This looks to be a fantastic, multi- purpose kitchen item. Would love to try this and see if I could lose a few pans from my kitchen. LOL, aren't you a generous perswon for giving these away on your own. How kind. Look forward to hearing from you with your great recipes and ideas as well. Take care. I hope I win! I do need to cook more at home. looks like a wonderful give away, please enter me, thanks! Oh! Very cute, definitely will look good in my kitchen and work well too! What a versatile pot. Great idea for a giveaway. Wow, very excited to be part of this prize giveaway. Very generous for you to do this. Excellent, so generous. Thank you so much! What a great giveaway! Thank you for pointing me towards your blog from your comment on mine. It's great to "meet" you. Congratulations, Christine, on your first giveaway! What a great giveaway! Yay! How many times have I needed this in my kitchen?? Great giveaway! One could never have enough pots! :) Great giveaway! Thanks for befriending me on foodbuzz! I'm really excited to see all the things you have planned for this blog! How very generous and kind of you Christine, and it's a great prize. Hi Christine, Thanks for stopping by my blog. Am now following yours too! Look forward to reading all the wonderful recipes you put out. You are such a sweetie for holding this giveaway. Thank you for your generosity! What a great giveaway! That looks like such a fun little pot. Congrad on your first year, love the pot !!! Thanks for the great giveaway opportunity! Love your blog..
What a wonderful giveaway and it is generous of you to do this on your own. Thanks so much. Nice giveaway idea. I've never heard of this pot - sounds handy! Love a giveaway! Please enter me into it. Thank you for following our blog. We are following you as well. i've never seen something like this...very cool! I appreciate you comment on Sandra's Recipes - Alaska, and I just love this giveaway - awesome!!! I love kitchen tools that have multiple functions!! Thanks for the giveaway!